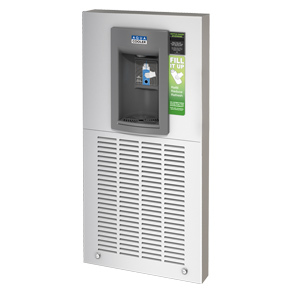 The Flexi Series is a range of wall mounted, bottle-filler water fountains. Flexi Series is also available in a handy space-saving form if refigeration is Not Required BFSS Range.This unit is the FLB-30MR it's mechanically operated push button. There is an optional hands-free upgrade avalible for added convenience you will find this in the accessories you may need section. This unit will produce 30lt of chilled water per hour. For A Data Sheet Click Here.